The Strongback is the base on which to build the canoe. The strongback is built using two 2'x6"x16' planks. (My strongback is actually made using corral boards, 1-1/4" thick by 6" full. Corral boards are not available from lumber yards in Oregon but they were where I lived in California.) 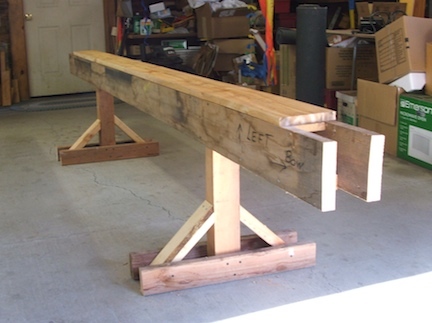 The planks are fastened together with short lengths of 2"x4" to make a double beam 6" wide (6-1/2" with regular 2"x6"s). Two 4"x4" legs with sturdy feet attached hold the beam at a comfortable height for building the canoe. For building Sunshine, I cut my strongback down to 11-1/2 ' in length. After years of lying on the garage floor my strongback developed a slight warp. Therefore, I attached flat 1"x6" boards to the top so I could draw a line straight and true down the center. Now I'm ready to mount the molds.